“The Sun Will Come Out Tomorrow!” America’s favorite cartoon sweetheart is back in one of the most popular Broadway shows of all. Winner of seven Tony Awards including Best Musical, Annie is a delightful concoction of comic villains, cute little girls, gangsters, Presidents, billionaires, butlers and bums. It’s a merry comic book world glowing with optimism from its side-splitting humor, to its carefree dances, to its tuneful score including that anthem of hope, “Tomorrow.” This uplifting show about the triumph of hope in a time of economic and political upheaval is even more meaningful now than it ever was. Truly an inspirational show for audiences of all ages! 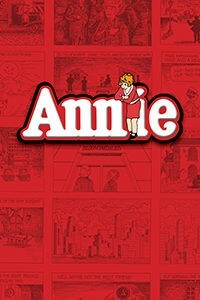 You’ll surely want to adopt Little Orphan Annie for your very own after you see the musical comedy smash Annie. An included delicious lunch features Signature Fruit & Garden Salad, Skinless Breast of Chicken stuffed with Havarti Cheese, dipped in egg, rolled in Pretzel Crumbs, served with a Balsamic Raspberry Sauce, Garlic Parmesan Orzo, Fresh Broccoli and Cauliflower, fresh rolls and Blueberry Crisp. Minimal walking.